25 Days of Christmas Tags with Simon Says Stamp! This is the second post for today! My Simon Says Stamp Challenge post is HERE! Tracey McNeely has been doing the 25 Days of Christmas Tags during the Christmas time for past five years. I have enjoyed participating in them for past three years. It is big source for holiday and Christmas tags for papercrafters. Lots of planning and efforts goes into it. Five years is a great milestone. Congratulations on your 5th Anniversary, Tracey! Today I am participating in the event as designer of Simon Says Stamp Challenge team member. 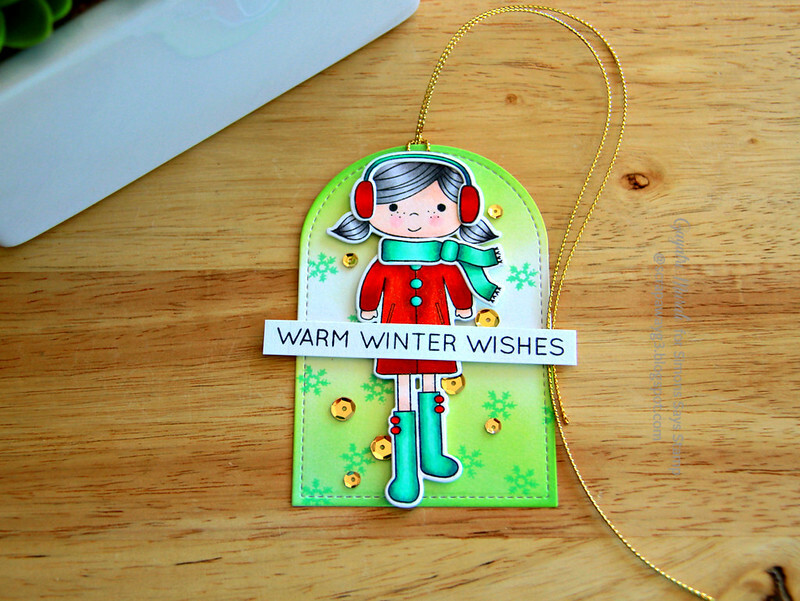 Here is my Christmas tag using Simon Says Stamp new release products. I started with stamping and colouring the girl and accessories from Simon Says Stamp Ready Set Snow stamp set from Creat Joy collection. Then I die cut them using the coordinating dies. I also stamp the sentiment from the same stamp set on a strip of white cardstock. The tag is from Stitched Duo 3 die set from Pretty Pink Posh which I die cut using white cardstock. I then sponged Crushed Olive and Cracked Pistachio distress ink on the top and bottom of the tag. Stamped the snowflakes from the Ready Set Snow stamp set using Cracked Pistachio randomly. I adhered the accessories on the girl image then the girl image on the tag using foam adhesives. I brush Wink of Stella Clear shimmer on the red coloured areas. Adhered the sentiment strip at an angle over the girl image. Embellished with gold sequins from Pretty Pink Posh and tied the tag with gold twine. Tracey is also giving away plenty of prizes. Check out In My Creative Opinion Blog for more details. Here are some fantastic sponsors. Make sure you leave a comment to enter a chance to win a giveaway! Wow Gayatri! You very well know how to pop up the colors! Wonderful color scheme with this cute girl image and tiny snowflakes in the background! Beautiful tag!! Love your coloring!! Very nice. Your tags are so wonderful! But then I adore everything you create! Such a sweet tag, Gayatri. Also love the colours you've used for your background! Gayatri this tag is just too cute and your o,luring is perfection! Thank you once again for joining me as my guest st the 25 Adams of Christmas Tags!! LOVE your SUPER CUTE girl & colouring, LOVE your GORGEOUS inky background too!!! These are adorable Great work! This little girl is so cute!